The Gitchi-Gami Trail Association (GGTA) is an all-volunteer nonprofit organization formed to work with the Minnesota Departments of Transportation and Natural Resources and the Arrowhead Regional Development Commission in the planning, development, construction, maintenance, and promotion of the Gitchi-Gami State Trail, and to organize trail activities, including the Annual Ride. Membership donations are used to help fund GGTA operations, including publications, communications, and administration; and to help defray costs of erecting information trailhead kiosks and purchasing maintenance equipment. The GGTA membership is statewide. A large percentage of GGTA members live outside the Lake Superior watershed. This widespread membership is key to developing broad state and federal legislative support, as well as foundation and grant funding, for the completion of the trail. 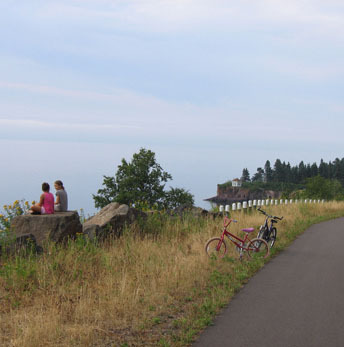 Please consider joining the GGTA, and help us reach our goal of completing a premier non-motorized trail from Two Harbors to Grand Marais, MN. Membership dues are $20 for individuals and $35 for families. Life memberships are $500. All members receive, among other things, a discount on Annual Ride registration. To join by mail, click on the MAIL-IN MEMBERSHIP link, print and complete the form, and mail with your check payable to the GGTA. To join online, click on the ONLINE MEMBERSHIP link. Online membership with a credit card is processed by secure PayPal payment. We invite businesses to support the GGTA with business memberships. See the BUSINESS MEMBERSHIP page for details. THE GGTA IS A QUALIFIED 501(c)(3) NONPROFIT ORGANIZATION. ALL MEMBERSHIP DONATIONS ARE TAX-DEDUCTIBLE.